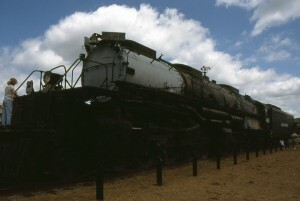 The “Big Boy” is an articulated 4-8-8-4 Steam Engine. 4-8-8-4 denotes that it is a locomotive with a four-wheel leading truck, two sets of eight driving wheels, and a four-wheel trailing truck, in other words, it’s HUGE. Only 25 total were built, including the one shown in this pictures, 4012. At 1.25 Million pounds in weight, and 6200 horsepower, it remains one of the largest locomotives to ever have been built. The first Big Boys were built and delivered in 1941, the last five of the series in 1944. They were built by American Locomotive Company based on designs from Union Pacific. The Big Boy’s are 132 feet 9 inches from end to end, the weight includes the 28 tons of coal, and 24,000 gallons of water it carried in the tender. 4012 spent most of it’s life hauling freight between Ogden Utah and Cheyenne Wyoming. It ran this route until it was retired in 1962 in favor of newer and more efficient diesel-electric locomotives took over. It’s typical load was 125 cars long, which it was able to move quickly and efficiently. It is now stored at “Steamtown,” in Scranton, Pennsylvania. Unfortunately due to it’s size and weight, it most likely will not move again. It can’t even fit in the round house there, and modern rails can not support it’s immense weight. But that may be for the good, as it’s no longer in working condition anyways. That does mean that she’s slowly rusting away though, hopefully restoration and preservation will be a priority in the near future.